This entry was posted in approaches of psychology, best psychology coaching classes in delhi, Best Psychology Institute, CBSE NET Psychology Coaching, Coaching Center in Delhi, coaching classes in madipur, M. Phil Clinical Psychology Coaching, MA Psychology Coaching, NET Psychology Coaching, psychology coaching class, psychology coaching in delhi, UGC NET Psychology Coaching on January 15, 2016 by UPS Education. 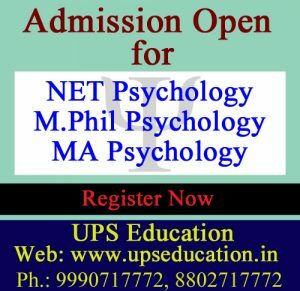 UPS Education is one of the top destinations for NET and M.Phil Entrance Psychology coaching where student can nourish their theoretical consent as well as practical. 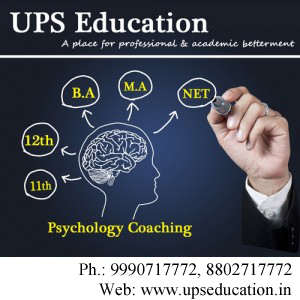 UPS Education achieved top place in Psychology Coaching and Sustains their quality and result since many years.UPS Education started a Distance learning mode for UGC|CBSE NET Psychology Entrance. This entry was posted in approaches of psychology, best psychology coaching classes in delhi, Best Psychology Institute, CBSE NET Psychology Coaching, Coaching Center in Delhi, coaching classes in madipur, M. Phil Clinical Psychology Coaching, MA Psychology Coaching, NET Psychology Coaching, UGC NET Psychology Coaching on January 4, 2016 by UPS Education. This entry was posted in approaches of psychology, best psychology coaching classes in delhi, Best Psychology Institute, CBSE NET Psychology Coaching, Coaching Center in Delhi, coaching classes in madipur, M. Phil Clinical Psychology Coaching, MA Psychology Coaching, NET Psychology Coaching, UGC NET Psychology Coaching on January 2, 2016 by UPS Education. This entry was posted in approaches of psychology, best psychology coaching classes in delhi, Best Psychology Institute, CBSE NET Psychology Coaching, Coaching Center in Delhi, M. Phil Clinical Psychology Coaching, MA Psychology Coaching, psychology coaching class, psychology coaching in delhi, UGC NET Psychology Coaching on December 5, 2015 by UPS Education. 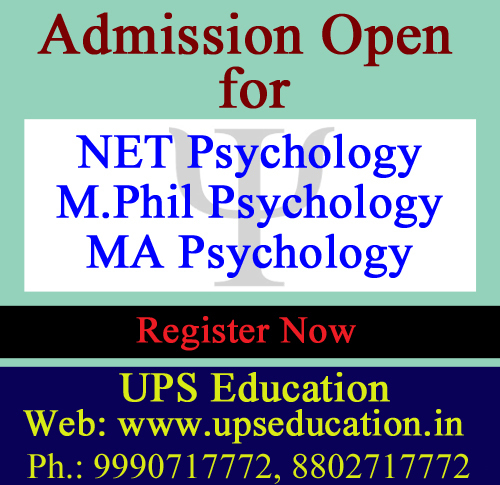 UPS Education achieved top place in Psychology Coaching and Sustains their quality and result since many years.UPS Education going to starts a new batch for NET Psychology Entrance, MA Psychology Entrance and M.Phil Psychology Entrance Examination of 2015. Our Notes are also very popular for NET Psychology, MA Psychology, and M.Phil Psychology Entrance Examination. 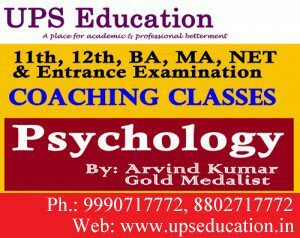 This entry was posted in approaches of psychology, best psychology coaching classes in delhi, Best Psychology Institute, CBSE NET Psychology Coaching, Coaching Center in Delhi, NET Psychology Coaching, UGC NET Psychology Coaching on August 1, 2015 by UPS Education. 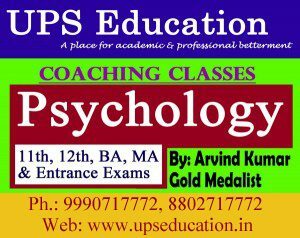 UPS Education always achieved top place in Psychology Coaching in Delhi. UPS Education providing a supportive, student-centered learning environment, which enables students to meet their educational and career goals and achieve positive learning outcomes. 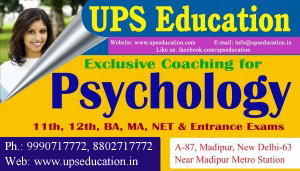 UPS Education provides Psychology Coaching for MA Entrance, NET Entrance, MA Psychology Coaching and all other Psychology Entrance Examination. Come and Explore Psychology with UPS Education. Area Covered: PaschimVihar, Jwalaheri, Peeragadhi, Punjabi Bagh, Raghubir Nagar, PaschimPuri, Rani Bagh, Multan Nagar.Nangloi, Kirari. This entry was posted in approaches of psychology, best psychology coaching classes in delhi, Best Psychology Institute, CBSE NET Psychology Coaching, Coaching Center in Delhi, M. Phil Clinical Psychology Coaching, MA Psychology Coaching, NET Psychology Coaching, UGC NET Psychology Coaching on July 28, 2015 by UPS Education. 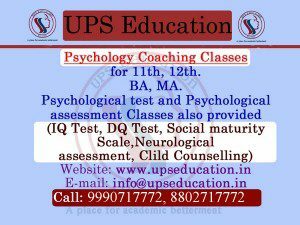 UPS Education introduce course-II for those student who want to crack NET Psychology Psychology Entrance. UPS Education is leading Coaching Center for Psychology Coaching in Delhi. This entry was posted in approaches of psychology, best psychology coaching classes in delhi, Best Psychology Institute, CBSE NET Psychology Coaching, Coaching Center in Delhi, NET Psychology Coaching, UGC NET Psychology Coaching on July 27, 2015 by UPS Education. If you want to join India’s premier institute for Psychology coaching but you are not living in Delhi. Good news for those students who want to creak NET, MA, M.Phil. Psychology entrance exam. But they unable to join any institute for regular coaching. UPS Education introduces their correspondence course for NET Psychology, MA Psychology and M.Phil. Psychology. This entry was posted in approaches of psychology, best psychology coaching classes in delhi, Best Psychology Institute, CBSE NET Psychology Coaching, Coaching Center in Delhi, M. Phil Clinical Psychology Coaching, MA Psychology Coaching, NET Psychology Coaching, psychology coaching class, UGC NET Psychology Coaching on July 21, 2015 by UPS Education. was concern about my NET Psychology coaching. I searched lots of coaching center but i decided to join UPS Education because teaching method of Arvind Sir are quite different and very attractive. Arvind Sir is Gold Medalist and also he is very supportive. Staff of UPS Education is also very supportive, they are always stand for us UPS Education is the best place for National Eligibility Test [NET] Psychology Entrance coaching. Area Covered: PaschimVihar, Jwalaheri, Peeragadhi,peeragarhi, Punjabi Bagh, Raghubir Nagar, PaschimPuri, Rani Bagh, Multan Nagar,Uttam Nagar, Nangloi, Kirari. This entry was posted in best psychology coaching classes in delhi, Best Psychology Institute, CBSE NET Psychology Coaching, Coaching Center in Delhi, NET Psychology Coaching, Psychology Classes, psychology coaching class, psychology coaching in delhi, UGC NET Psychology Coaching on April 8, 2015 by UPS Education.